When my mother was in High School, not to give away anyone’s age, but let’s just say that it was sometime in the 60’s, she took a class field trip to New York City USA. Quite the adventure for a small town Ohio girl. As part of the organized field trip, the kids had a chance to see a real life Broadway musical. They had 2 top shows to choose from. The first one was a cavalcade of big name Broadway stars…Orson Bean, Sydney Chaplin, Carol Lawrence, Gordon Connell, Grayson Hall, Phyllis Newman……that my young Mother just couldn’t pass up. So she saw Subways are For Sleeping. I know, I’d never heard of it before either….. So I did what anybody my age would do…..and Googled it…..
Angie McKay is a magazine writer assigned to write a story about a group of well-dressed homeless people sleeping in the New York subway system. Their leader is Tom Bailey, a one-man employment agency who finds other drifters odd jobs (Street-corner Santas, mostly) and sleeping quarters. To help research her story, Angie goes undercover and pretends to be a stranded girl from out-of-town. Trouble/Hilarity ensues when Tom discovers her real identity. 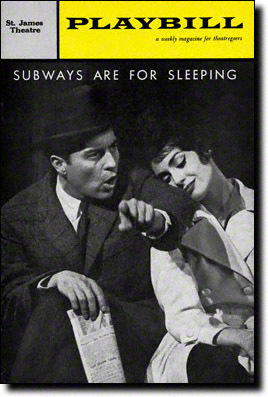 The entire musical was inspired on an article about New York’s homeless population in the March 1956 issue of Harper’s written by Edmund G. Love, who actually slept on subway trains throughout the 1950s. Love had a bizarre hobby of eating at every restaurant in the Manhattan Yellow Pages in the exact alphabetical order in witch they were listed. Subways Are for Sleeping opened to mostly negative reviews. The show lacked publicity, mainly because the New York Transit Authority refused to post any advertisements for fear of vagrants misunderstanding the adds as an actual invitation to sleep in the subways. Producer David Merrick had the brilliant idea to invite individuals with the same names as prominent theater critics (such as Walter Kerr, Richard Watts, Jr and Howard Taubman) to the show and then print their favorable comments in print adds. Unfortunately for them, the adds also had photo accompaniments, and the picture of well-known critic Richard Watts was not a black man. 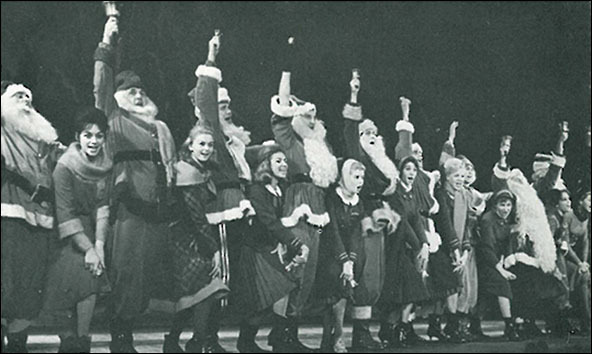 It was this cleverly publicised stunt that gave the show the little traffic it needed to survive for a few months on Broadway. Phyllis Newman, writer Green’s wife, won a Tony for Best Featured Actress in a Musical, despite – or possibly assisted by – the fact that her costume was only a towel. And just what was the other Broadway show that she could have chosen?…. She can’t recall what the name of that show was. Ok that part about the producer hiring other people with the same name as critics to give the show a thumbs-up is fantastic! As is the part about the transit authority worrying that “Subways Are For Sleeping” would be seen as a suggestion! Thanks so much for the edification, and for a delightful post!